Earlier this week SearchStar’s social media pioneers, Jo and Will, found themselves summoned to Facebook HQ. Despite having to get up earlier than any civilised human being should, they enjoyed a day finding out more about Facebook Attribution and what it means for advertisers and media buyers alike. The issue is showing the true value of different media channels in a world of complex paths to conversion. Customer journeys are fragmented; with cross-device activity, multi-channel touch points and - for social and display in particular - users engaging with ads without clicking. Paid search is the goal-hanger for brand-focused activity, but you can't achieve growth at the bottom of the funnel. Perhaps Wannamaker’s words are still as relevant today. In a drive to deepen the insights marketers can get from Facebook, they’re tackling attribution by launching their own solution, conveniently named Facebook Attribution, which is now available within Business Manager. What Will Facebook Attribution Do For My Business? Facebook Attribution focuses on analysing user behaviour before conversion and how each touch-point contributes to a conversion, moving the focus away from the users last click. As a result, it will give marketers a more holistic view of the impact of their marketing activity, tying in how upper and middle funnel awareness activity supports and drives conversions over time. Through their Data Driven Attribution system, it’s also possible to analyse the lift as a result of advertising (how many users convert that wouldn’t have organically) and measure the incremental impact the activity has. Quite simply, it may well prove vital for any advertiser running prospecting activity on the platform. How Can I Access Facebook Attribution? Facebook Attribution sits within Business Manager, and requires very little set up in addition to the standard Facebook tracking, as data is collected predominantly through Pixels and UTMs. Doing so will give users access to a host of additional insights at no extra cost. Lookback windows of up to 90 days give advertisers better insights into middle and upper funnel activity, and how it impacts users prior to conversion. It also allows advertisers to tailor their conversion tracking to the purchase cycles and customer journeys in different industries. 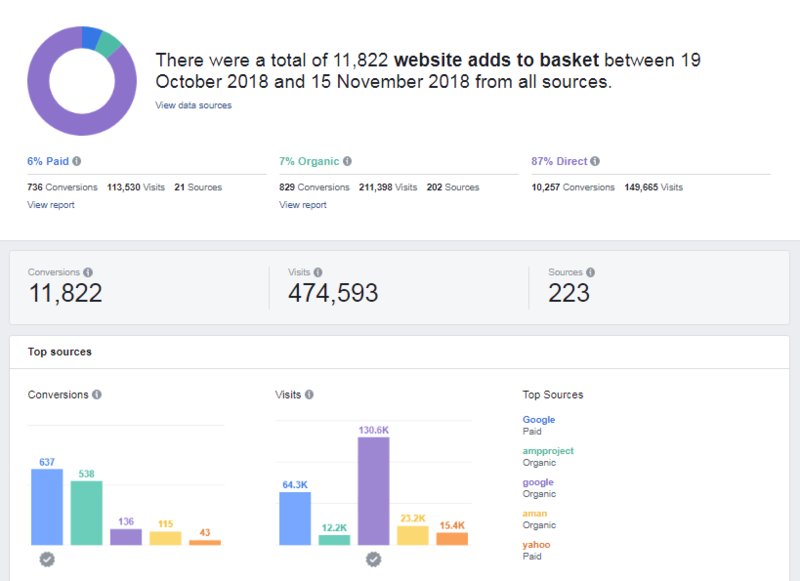 Data from other channels can be integrated into Facebook Attribution, giving visibility on search and direct conversions, and the user journey leading up to that point. There is also pre-configured links to Google Ads, Campaign Manager and Bing, giving advertisers a more holistic look at the impact of their activity throughout the purchase funnel. Cross-device analysis reports on how users interact with brands on other devices prior to conversion, giving an extra level of depth of analysing the importance of cross-device advertising. Facebook Attribution offers several different attribution models to choose from, allowing users to evaluate attribution in different ways. While Last Click may be easy to understand, simple to interpret, and "what-we've-always-done-you-see" it’s by no means focused on the larger picture. A more open-minded approach to attribution and looking beyond last click allows advertisers to analyse the build-up play (the winding, non-linear customer journey) that is so vital to the final action before conversion, and weight advertising budgets accordingly across the funnel. By no means should it be a replacement for other analytics and reporting tools, and it isn’t the first analytics tool to look beyond last click, but using Facebook Attribution in conjunction with other tools will provide a more balanced, more complete view of the user journey and the impact of advertising.